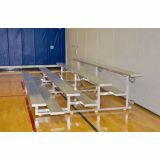 All aluminum seat planks and galvanized steel understructure provide a lightweight, stable bleacher. Seat planks are 10'' wide non-skid aluminum. Planks are supported by a strong, galvanized steel understructure made of 3/16" x 1-1/2" steel angle. Dual braces and rear stabilizing bar are included for additional strength and stability. 3 row 15' long. 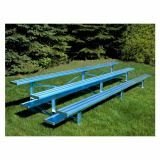 All aluminum seat planks and galvanized steel understructure provide a lightweight, stable bleacher. Seat planks are 10'' wide non-skid aluminum. 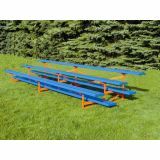 Planks are supported by a strong, galvanized steel understructure made of 3/16" x 1-1/2" steel angle. Dual braces and rear stabilizing bar are included for additional strength and stability. 4 row 15' long. Four row bleachers do not exceed 30" in height, therefore guard rails may not be needed! (Check your local codes).